A trail run at Mount Van Hoevenberg yesterday revealed what I had hoped: Adirondack wildflowers are jumping out of the ground these days. 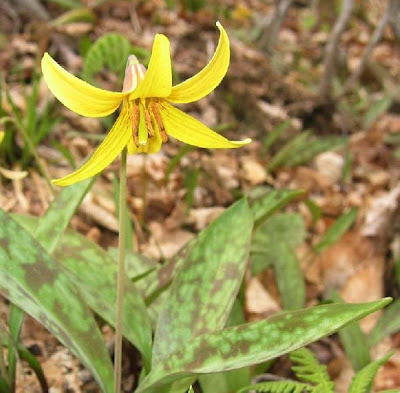 There are carpets of today's featured photo beauty, Trout Lily, to run around, and the Trillium are almost ready to open. I love the way nature cooperated by matching the flower and the fish since they frequently appear near each other. The Spring Beauties are everywhere, their dainty bloom noticeable only because there are so many. The flora is finally waking up here in the Adirondacks and it is gorgeous. We may be a little behind the rest of the country, but it is worth waiting for.